jobs | I'm not stalking you. Do Divine Forces Communicate To Me Through The Radio? I don’t believe in God. Although I do think there might be some sort of higher force affecting our lives on a daily basis. That force might be Fate. I also believe that Fate can play cruel tricks on us at times. All that aside, do you think that it is possible that God communicates to me through my car radio? Because after this week, I think that maybe he just might. If he existed. This week I was on my way to work, wondering why I was going in when the job clearly makes me miserable. So much so that there was an anonymous vote at Thanksgiving dinner saying that I should not head into work that night. But I did anyway. Not really sure what is wrong with me in that respect. I usually blame my freakishly responsible nature on being a Capricorn. Now, the commercial actually goes on to try to impress customers by talking about the extended shopping hours available on Thanksgiving and Black Friday. It was not meant for employees at all. But I took it as my sign that I should terminate my employment soon, in order to return to some semblance of sanity and to enjoy the holidays with my family. The irony of all this? My boss most likely arranged and paid for those commercials. After this, I was pretty certain of my course of action, but worried about how my family would manage with less income. Then on Sunday morning, as I went to the grocery store in my pajamas and slippers to buy more pop, the local station had on some religious programming. Usually I change it right away, but this time I didn’t. The pastor was talking about moving to a small town and trying to find an office job right as the recession hit. I don’t remember his exact words, but it came down to that he was fretting about if they had made the right decisions or not. He worried that they should move to the city. Then he realized that he should just stop and be grateful for what he did have. The jobs that he and his wife had, even if they were not ideal. The friends who touched their lives every day. I don’t know much, but I do know that gratitude works. I was always grateful for my Pontiac Aztek, even after it died. The Universe provided me with a Jeep Patriot to purchase that I am very happy with. I do fret that committing to the loan may have been an error. But my asbestos friend would tell me to not turn down gifts from the Universe. But the Universe is not always clear on what decisions I should make. Posted in A day in the life, Job hunting, What I Learned This Week and tagged commercial, communication, destiny, employment, fate, God, gratitude, jobs, radio, religion, thankful, work. Bookmark the permalink. A pictograph of my life right now. As a writer, I am working on like 4 novels at once. I hope to have once finished soon. I am also trying to keep up my blog, as I do not want to lose views just as I might have a product (my future book) to hock to them (THIS MEANS YOU!). I don’t want to abandon my only marketing tool. I have also learned that I write because “I can’t not write.” So, I might as well try to find a way to use that to move toward a goal. Making a little money from it would be nice as well. 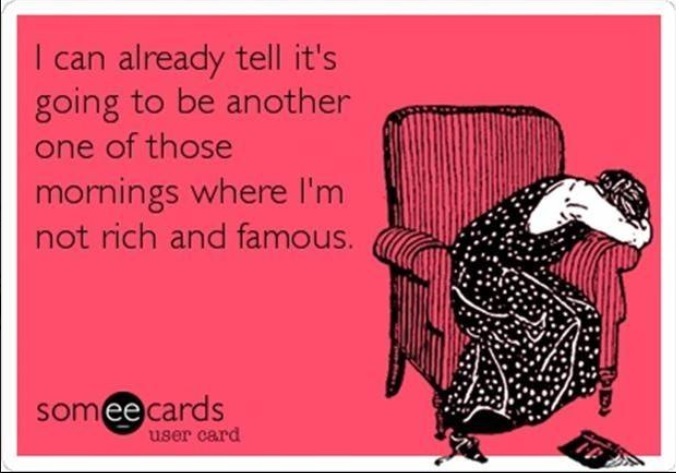 Fame and fortune would be AWESOME! I am not a stay at home mom, because I work part-time outside the home. But when I am home, I am chasing my child, trying to keep him clean and fed and happy. (The “happy” part is almost impossible.) I am also trying to keep up with the laundry and dishes and sweeping. I aspire to complete a thorough spring cleaning someday…for 2011. We also have two large dogs. So some days I feel like a zookeeper as well. I work about 15-20 hrs per week in a retail customer service job. So, I spend all day waiting on my child’s beck and call, then I head off to get paid to do the same thing for strangers. I have an hour commute one way. So, if you figure I usually work 3 days per week, that is 6hrs I am gone from home and not getting paid for them, plus gas. It cuts into the bottom line. I know it sounds silly, but you have to understand that we love our house and want to stay close to our family. Therefore, we live in the land of very few good jobs. To get a job similar to the one I held for 12 years prior, we would have to move closer to Detroit, or a different city. We don’t want that. So, we make due. I know that my husband does not see it this way at all. I try and throw the “three jobs” thought out there once in a while, but I don’t think he understands what I am getting at. He just sees my small paycheck and thinks I should get a different job. He views my writing as a hobby. But I looked for a job for a year and a half, before I found this one. And where I am at now, I am actually making more than minimum wage. If I got a different job, that might not be the case. The minimum is the new maximum, me thinks. And with this job I have thus far avoided daycare for my son, which, could lead to additional costs. I don’t think he realizes that in 2003, we tried to run our own business, because he wanted to. I supported him, because I knew a version of that had always been his dream. We were also planning our wedding at the same time. It was highly stressful. It was one of those businesses that only thrives if you sign up people to be under you. We never got any. We gave up on it. The info and motivational tapes from that are still sitting in our attic. Like a big sign that reads “failure”. When we were both out of work a few years ago, he tried a self-employed venture. Once again, it wasn’t exactly his big dream, but it was something he would enjoy doing more than factory work. I supported him. The market was not real good at that time, and it was a hard business to network. It was hard for a new kid on the block to get word of mouth, when there were so many established people in the field available. He put that venture on the back-burner after a year. The advertising from it is still sitting in our driveway, a literal “sign” that makes me sad. That is two years of my life of letting him take his chance on a dream. So, I am looking at 2014 as my year to pursue my dream. I am just not sure that he has realized that yet. We might not have a lot of food in the cupboards, but we are not going hungry. Working part-time allows me more time to work on my writing. I have not reached my goals yet, but I AM GETTING SOMEWHERE! I AM CLOSER THAN I HAVE EVER BEEN! Will my goals cost a little money to get there? Sure. Will my writing pay out big dividends? Most likely not. Did my husband’s? Not so much. Were his ventures important to him? Of course. Are mine important to me? Damn straight. Imagine the wonderful harmony in our household if at least one of us was doing something they enjoyed as a part of a career? Imagine if we BOTH were. I don’t want to walk by boxes of my writing upstairs and have it remind me that I failed to meet my goal. I have been doing that for 20 years already. I am done with failure. I want some success. Posted in A day in the life, Job hunting, Unusual Poetry & Writing and tagged 3, author, business, career, customer service, failure, housekeeping, jobs, maid, mid-life crisis, Mom, novel, part-time, publish, retail, self-employed, success, ventures, work, writing. Bookmark the permalink. A year ago, I was desperate for a job. But even then, there were some things that turned me off to certain jobs. I applied to many jobs that required a drug test. Only one actually was interested in me enough to want to send me for one. But, as I got a concrete job offer from a different business, I took the concrete job offer. The place requiring the test had not given me a job offer. I was just in a big cue with a bunch of other desperate applicants. Mostly, I did not want to take the drug test. Now, Lazy Hippie Mama will vouch for me, that I am the squeakiest clean girl out there. Actually, she laughs at me that I don’t want to take one. The test would not have found anything. But I don’t really want any job enough to give them my bodily fluids. Unless, say maybe Edward Cullen is looking for blood donors. It is like in high school when my favorite teacher asked me why I wasn’t going to join the school’s anti-drug program. He must have been curious. He knew I was a good kid, did my homework, co-editor of the school newspaper, of which he was the adviser. Aside from the obvious fact that it was a big phoney club full of students who most definitely did do drugs, I told him the truth: I told him that I wanted to keep my options open for illegal drug use in the future. I still have that viewpoint. So, that brings me to the purpose of this post. I have never been big on dress codes, but realize that in some positions they are made a necessity by the management. I can’t even get the words out. Not only that, she wants them to be black! YOU: Why DON’T you match your sox? MY REPLY: Why SHOULD they match? Now, when I was hired a year ago, I gladly agreed to wear black, closed-toe shoes with black pants and a work shirt. They never said anything about socks. There is nothing about socks in the employee handbook. At one point, my manager’s manager saw my socks, and we had a whole conversation about why I mismatch them. She never indicated that this was a bad thing. With new faces at the top of our local rung of the corporate ladder, we have now been instructed to wear black shirts under our work shirts, and black blazers over them. Now, mind you, we have to buy EVERYTHING but the work shirt ourselves. And if the minimum wage were to be raised to the value that the President of the United States has thrown around in the press since his State of the Union speech, I would stand to get a raise of over a dollar. I would be really upset about the blazer thing, if I did not already have one. And since I don’t have any black shirts without Twilight logos or characters on them, I had to buy one of those just to wear for work. But this sock thing really irks me. Afterall, mismatched socks IS MY THANG! And, I mean, no one is probably even going to notice, as my pants meet the tops of my shoes. But I feel like there will be secret sock patrols out to catch me! I feel like I do my job pretty well. But part of me wonders if they would fire me over non-conforming socks. They are not like a ring in my nose or a tattoo on my forehead. Although, what would really be so wrong with those things either. 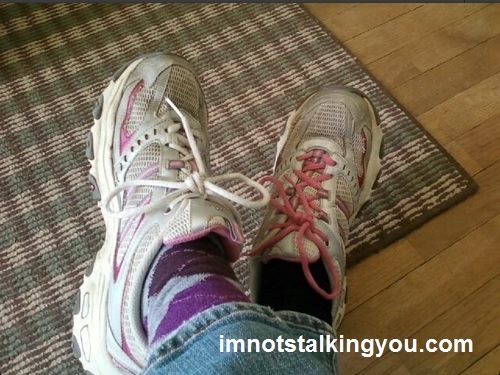 Socks are a personal, private thing between a person’s feet and their shoes. Socks are like underwear. You wear them under your pants and shoes. I would not work at any job that tries to legislate my underpants and bra. And if they did fire me over socks, it just might be worth it. I would still have my self respect. And imagine when I fill out future job applications. They will say “Reason for Leaving”, I could put “I wouldn’t wear black socks.” Some might see that as stubborn or not a team player. But some future employer might see it for the ridiculousness that it is. Posted in A day in the life, Job hunting and tagged bodily, card, code, Cullen, dress, drug, Edward, fingerprints, fluids, jobs, library, mismatched, socks, sox, tests, Twilight, work. Bookmark the permalink.